July 7, 2017 – Red Rocks Community College students who are planning careers in science, technology, engineering, and math (STEM) fields are gaining valuable experiences through Research Experience for Community College Students (RECCS), a summer research internship program at CU-Boulder sponsored by the National Science Foundation and the Boulder Critical Zone Observatory. RECCS provides community college students with an authentic research experience that allows them to explore environmental or geosciences to prepare them to transition to four-year programs in the STEM disciplines. Red Rocks students Shala Wallace, Jesse Barber, and Sean Ross participated in the research program in the summer of 2016. Wallace and Barber graduated from RRCC last year and transferred to four-year universities. Ross, an RRCC student who will transfer to Colorado School of Mines, conducted a research project entitled: Rock Weathering Observed in Outcrops and Bedrock Exposed by Debris Flows: A Preliminary Investigation of Granodiorite Weathering in a Landscape Context. Sean explained that weathering of bedrock is a central facet of landscape development, yet surprisingly little is known about processes or their rates. Rock weathering sets the stage for sediment production, and so is a controlling factor in the pace of landscape evolution. 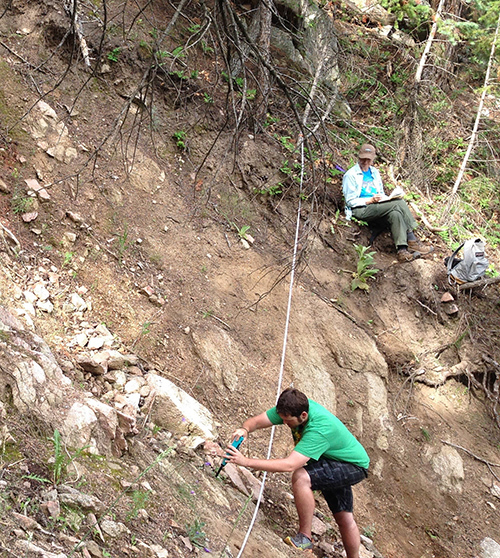 Sean explored rock weathering in Boulder Canyon, and with his mentor compared the condition of bedrock exposed on the steep slopes by debris flows resulting from the September 2013 storm with rock that had already been weathering at the surface for different lengths of time. The 2017 RECCS program is currently underway and will run through August 4. Red Rocks Community College geology student Sheena Skinner was selected for this summer’s program and is studying satellite thermal imagery data of a Greenland fjord. Sheena will compare the water temperature changes of the fjord to the known Greenland glacier changes since 2000. She will be working with python coding, a programming language that will allow her to create her own computer models from scratch to make a successful model to represent her data.